Bupkis.org – Terry Carmen's favorite things: Friends, Cooking, Eating and SCUBA Diving. My ciabatta bread recipe calls for very little yeast and a long, cool, slow rise. The flavor and texture is better than anything you’ll find in a store, and quite a few bakeries. You owe it to yourself to try making your own bread. It’s not difficult and it tastes incredible. 2.2 Lbs (1000g) Bread Flour, unbleached, un-enriched, if possible. I use New Hope Mills. Make the water about 70°F (use a thermometer!). Add the water, sugar & yeast to the dough mixer bowl and whisk (by hand) until dissolved. Let sit for 10 minutes. Add about half the flour and start the mixer on slow. Once the ingredients have been mixed, add the salt. You need to add the salt after the yeast has been mixed into the dough, since the salt retards the action of the yeast. Increase speed to medium and add the rest of the flour. Note that you may need to use slightly more or less flour than specified depending on the amount of moisture already in the flour. Continue to slowly add flour 1/2 cup at a time until the dough just cleans the sides and bottom of the mixing bowl. The dough should be all on the dough hook, and not on the side of the bowl. If it’s still stuck to the bowl, add a little more flour and knead a while longer. Keep kneading until you can windowpane the dough: Take a small piece and flatten and stretch it out into a disk. If you can get it thin enough to get a semi-transparent membrane before it tears, it’s ready. If it tears before you get the windowpane, knead for another 5 minutes and try again. Because this is a very wet dough, it takes a lot of kneading to develop the gluten. 15 minutes is not too long, and you may find it needs 20 minutes. Put the dough into a 4 Quart plastic bucket with a snap-on lid, and let rise in a cool place for about 8-10 hours, or until doubled in size. Note that because of the tiny amount of yeast used, the room temperature is critical. If it’s too cold, the dough won’t rise; if too hot it will rise too fast. Anywhere between 65°F–70°F should be OK.
After the dough as doubled in volume, remove it from the bucket, and gently fold it over on to a floured cutting board. Don’t “punch” it! 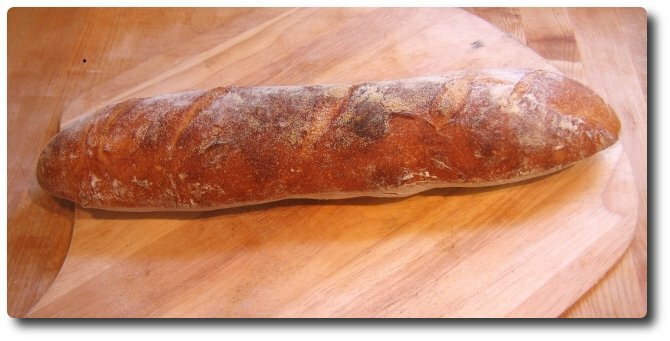 Portion the dough into quarters, and very gently form each into a loaf and allow to rise again until not quite doubled. Place two pizza stones in the oven and preheat to 425° for at least an hour. Generously dust two pizza peels with cornmeal. Take a very sharp knife or razor blade and make several diagonal slashes across the top of each loaf. This will allow the dough to expand as it cooks, giving it a better texture. Heat a small cast-iron frying pan on the stove until very hot. Bake for 30 minutes or until dark golden brown.